I created Godhead Machinery as a solo band during 2015 when my previous black metal band Misericordia were put on ice. I have been exploring the concept and behavior of religion and political structures that pollute our societies for several years now and wanted to focus on these kind of topics with Godhead Machinery. I had written most of the songs until 2016 and then realized that I needed a drummer to be able to take this concept to the next level. I were lucky enough to come in contact with Marcus who's were known for his drum skills so we could realize the Ouroboros album. We then decided to create a full setup for this project after the recording of Ouroboros and I started to pinpoint good musicians that I wanted to work with to fill all empty positions in this band. This is the line-up for future live shows and recordings. 2.You have an album coming out in September, how would you describe the musical sound that is presented on the recording? It's hard to describe but our main atmosphere and sound can absolutely be traced to both the old and new era of black and death metal. We have included a lot of harmonies, solos, dynamic and more advanced riffing in our music that can be associated with death metal and other metal genres. Some of the tracks has been written for seven string guitars and some only for six string guitars, which also gives a variety in our songs and feeling. The album were recorded in Milk Studio which is one of the finest and largest studios in my region, so the sound is professional but still unpolished, raw and aggressive. Ouroboros will contain seven tracks and four of them are more technical and the rest are more atmospheric if you categorize them very roughly. Each song has their own topic on Ouroboros. We have our concept that circles around religion and politics. The song The Plague is for example based on how terrorism grow and behaves in our world. Most of the songs has been inspired by different part of the bible (NKJV). Revelation is for example based on the thirteenth chapter of the Book of Revelation and is about economics. The song A House Divided is based on possession and exorcism and are among others inspired by the verse of Mark 3:20-27. 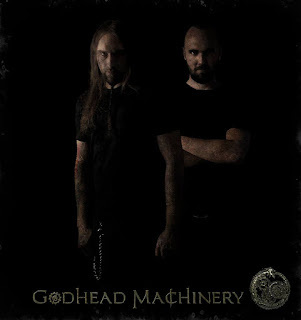 4.What is the meaning and inspiration behind the name 'Godhead Machinery'? Our name can be explained as a machinery of religion and politics and how that has stained all societies with different kind of superstitions, greed and cultures during our history. The world is and has always been infected by egocentric leaders, mostly chosen in the name of a religion or directly by a invented God. These fools have during centuries formed the uneven economic structure that rule the world economy now. This is a un-empathic blind system who all too often only calculates on economic profit and rewards short-term investments without any thoughts of any social or environmental sustainability. Most of the human race has accepted to stay blind and numb, all to engage their lives to enrich their companies and superiors. The next generation of children are raised and schooled to do the same as soon as possible without any hesitance. Religion is the first, strongest and the most central instrument to control mankind. Most societies are mainly based on religious laws. Corruption, war and short-term actions have fueled the fear and terror on the globe and all is claimed as a part of Gods grandeur plan if questioned. God has always been the largest cog in this machinery of today's wicked system. The name Godhead Machinery summarizes this hell that wicked leadership and religions has caused this planet during centuries. We haven't done any shows yet since Godhead Machinery were started as a solo project. We have and will rehearsal now when we finally are full lineup. 6.Do you have any touring show plans once the new album is released? Live shows are not prioritized but we might do some performances if we will get the chance to play on the right arena and under the right circumstances for us. 7.The album is coming out on 'Inverse Records', are you happy with the support that they have given you so far? Absolutely! They are very quick in their response and easy to work with so far. We haven't reached out to so many people yet since we only have released one official single song so far. But the direct response to Inverse Records from zines and others who have had the privileges listen to the whole album looks very promising so far. I have already started to write some new songs and we will still blend our songs with technical riffs and more calm atmospheric parts but probably focus more on the harmonies than on technical riffing on future songs. The next album will definitely have a lot of common elements with Ouroboros but might be heavier and darker. I listen to everything that I like today no matter what genre it is. I have very hard to appreciate joyful music though and really hate when especially black metal bands use happy melodies. I always tends to go back to the genres of black and death metal when I take the time to listen to music instead of creating music, since that genre is closest connected to my emotions and personality in general. Acts like for example Mayhem, Burzum, Dissection, Emperor, Morbid Angel and My Dying Bride still means a lot for me. It is hard to find any more spare time besides music since I have to manage a full day work also. But I play lead guitar in one doom metal act called Warden Clyffe also that we hopefully will record a second full-length album with during this year. I also play and drink beer with some childhood friends in a band called Fallen Mankind sometimes. I besides that practice an martial art form called Te Shin Do a couple of days each week when I'm not spending my time with my guitars, family or friends. Always criticism the sources of everything that seems to be too good to be true and feel free to follow us on our platforms we have on Internet. I has been an honor for me to do this interview if you have read or listened so far.